Fruchtgummi in Kirschform. Die Süßigkeiten sehen tatsächlich wie Kirsche aus. Zwei kleine Kirschen hängen aneinander wie Ohrringe. Inhalt 200g Beutel. Explore with us up in a wide range of confectionery for all ages. You will find in our store different categories. In fruit gum we have different versions of packaging units. Either practical or more cost-bag Boxes and Mini bag. Whether Licorice, Marshmallows and Sour, we always have plenty in store. The section lies the most delicious to Chew gum. Starting with the breath of fresh Doublemint through to the first Cinnamon gum Germany. Of course, individually or in large packs. Delicious Chocolates in various forms, Chocolate Specialties such as Chili-Chocolate but of course there are the traditional Chocolate bars with us under Chocolate. Fruit snacks and Potato Chips but also delicious Pastries we must not be missed. In Lollies area, we have prepared a variety of Sugar Sweets from different manufacturers. Furthermore we have to have the classic Candy from A to Z for the claimed neck or simply a pleasant and soothing taste. In Honey, see last about 40 different varieties and sizes of the bee Sweet Gold. Reliability, customer service and quality are our highest priority. Sweets as mail order, we are continually expanding our product range with the latest delicacy. Our product range includes only the best products at reasonable prices. Of course, all our products meet German quality standards, which ensures high quality during production. Before your product leaves our house, we check the packaging for damage and possible impairment of the function. Your order will be processed immediately upon receipt by us of course. The delivery of your order is currently within 3 to 5 working days. In addition, of course, very small quantities without charge as insured package will be shipped by DHL, which guarantees a fast delivery. 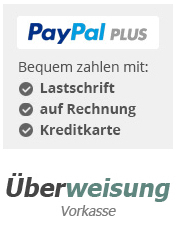 Payment is either by cash in advance, PayPal or Sofortüberweisung.